Anyone who had a PlayStation Portable, Cellphone or PC will probably remember Sky Force, a 194X-clone which was revolutionary for its realistic graphics and use of 3D CGI. To begin with, the game starts directly to the action. Starting off as a grey plane where you face a large plane as a boss. However there's no way to clear the level since all you can do is damage the boss, but you can't destroy it. So the only way to complete this Opening Stage is by getting killed by the boss. That's right. You have to die if you want to complete the opening stage. After "completing" the Opening Stage, you can select the first mission, where you will get your new plane. A recolor of the plane you've lost in the Opening Stage. Welcome back! here's your new plane. Build it up before facing General Mantis again. However, this new recolor can be enhanced by the combination of two methods: The first one is the traditional Power-up system during a level by picking Weapon Upgrades that increases its fire rate and the second by increasing its strength in the Hangar. 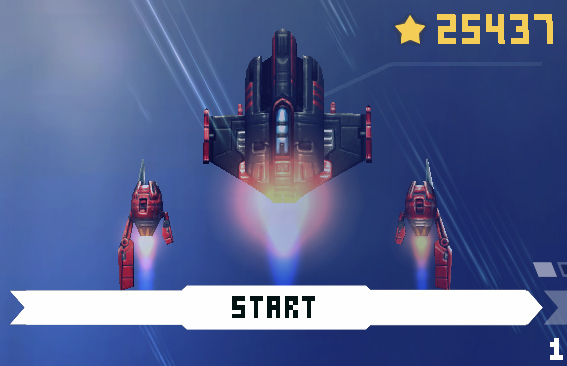 To power up your ship in the Hangar, you have to pick Stars dropped by destroyed enemies. Stars are your currency in this game. Like in U.N. Squadron, this game relies on the "Upgrading via Money Investment". You can buy more hit points, a stronger firepower and even new weapons and powers. Once you buy a weapon, you can upgrade it 10 times, same for your Health and Firepower. HEALTH: Like its name says, it increases your life gauge, which is measured by percentage and only appears after getting a hit. Upgrading your Health and the Main Cannon is VITAL to survive, so consider them a Top Priority to upgrade first. MAIN CANNON: This is your main weapon, a linear shot that fires in a quite slow pace. However, picking up "Weapon Upgrade" items during your mission will increase its fire rate. WING CANNONS: The Wing Cannons are an additional Twin Shot, providing a slightly wider firing range. Also, adds aditional strength to your shots. MISSILE: The Missile combine the homing properties with the strength of a standard rocket launcher. Although its fire rate can be slow (1 missile every 2 seconds) it is fired automatically without needing to press the fire button. MAGNET: It isn't a weapon, it's a ship upgrade, and a very useful one too. The Magnet attracts the Stars near your ship within its range, pretty much like the Bonus Items in Triggerheart Exelica and the Medals in Raiden V. The player can upgrade the range and attraction power of the Magnet. ENERGY SHIELD: This is the first of the "Special Weapons" which work as the "Bomb" of your ship. The Shield provides a circular Force Field that grants you invincibility for a short time. Upgrading it gives you more time. Press the "X" Button to activate the Shield. LASER: Second Special Weapon. It fires a powerful Superlaser like the FS-X's Ninja Beam from Aero Fighters or the Sword Over Weapon from Thunder Force V. The Laser is also the most useful of the Special Weapons because it is extremely effective against bosses. To fire the Laser, press the "Y" button. MEGA BOMB: Third Special Weapon. The Mega Bomb is a powerful pulse that damages (or destroys) anything in its path. The only flaw is that you can only carry 3 of them instead of 5. The Mega Bomb can be used by pressing the "B" Button. Every once in a while when you play a level many, many times you'll find a Card which gives you special features. The more you find, the more extra bonuses you'll get. 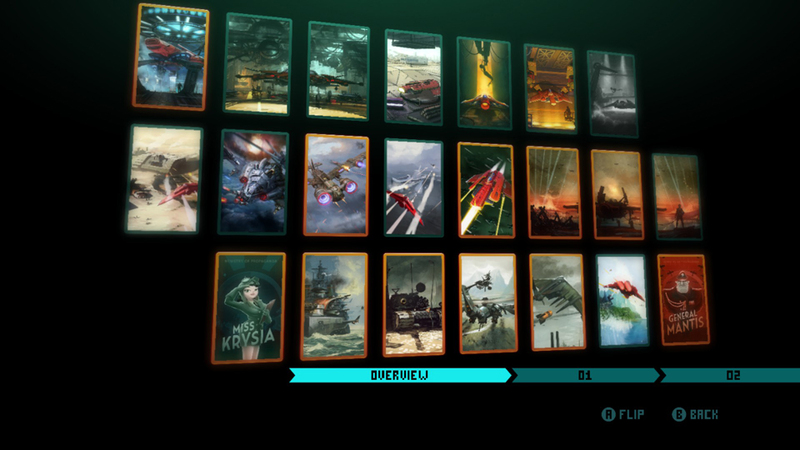 In total there's 22 Cards in the game. Here's the list of Cards and their effects. #01: Depicts the player jet being lifted in a high-tech looking hangar. Gives you an "Increased Chance of Finding Cards". Which means they appear by a matter of luck. Just like the Cube of Zoe and the Luck Point-Item Drop Frequency factor of Castlevania Symphony of the Night, Card #01 increases the possibility of finding more Cards. #02: The player jet in a hangar. This Card and Card #03 for a larger pic. Card #02 gives you a Support Drone which will be placed on the left side of the ship. #04: Another "Jet in the Hangar" pic. Gives your missiles a 10% faster reload. #05: Illustrated by the jet in a Hangar with a mechanical arm above. Gives you a 5% reduction in the Human Rescue time. #06: Yet another pic of your plane in the hangar, apparently hanging on a furnace. Gives you a "Lucky Shield". 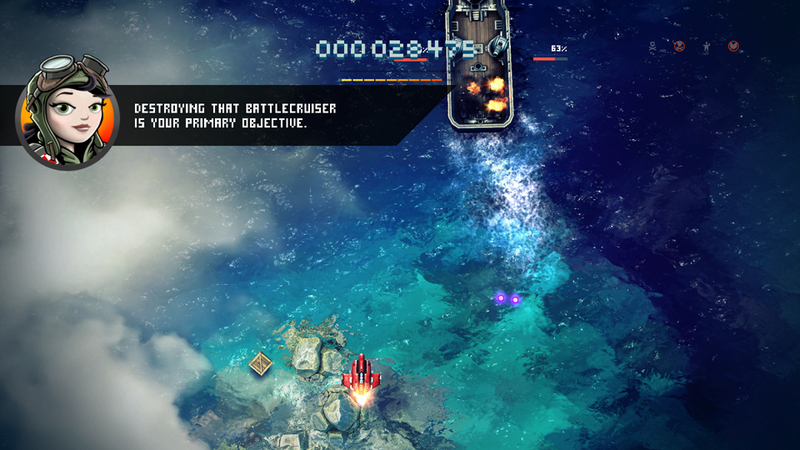 As its name implies, your ship will activate a few second lasting shield protecting you from a hit. Apparently that's activated by pure luck because sometimes its activated and others don't. #07: One more "Jet in Hangar" pic. This one is a 2-Player Mode only effect card where your Ghost collects stars. #08: Your jet shooting an enemy tank. Gives you a +1 on your Initial Fire Rate. In short words, your bullets will be fired 10% faster than normal. #09: Stage 6 Helicopter Boss. Gives you a +1 on your Initial Fire Rate. Combined with Card #08 your shots will be 20% faster than before. #10: Prologue Boss / Stage 8 Boss. Gives you "Star Doubler", which duplicates the value of your Stars either if you get Game Over or you pass the stage successfully. #11: Shows your jet attacking a submarine and a plane. Gives your Missiles a 10% extra damage. #12: Your ship firing its Laser cannon. Gives you 10% of Energy for your Laser Beam, which means the blast will last for a little longer. #13: A war scene at sunset. Gives you 10% of Power for the Mega Bomb, giving it much more strength to its already deastating power. #14: Your ship ouside of the war scene at sunset, this is the second part of a larger pic depicting a major war scene. Gives you 10% of durability for your Energy Shield. #15: A pilot witnessing an air raid in the distance. This is the third part of a larger pic depicting a war scene. Gives you a 5% length in the "Rescue Rope" used during a Human Rescue, increasing the range needed to pick people. #16: Ministry of Propaganda card featuring Miss Krysia. Gives you a 10% discount in the Hangar upgrades. #17: Shows an enemy battleship. This Card gives you "Health Regeneration". #18: Depicts a Tank. Gives you "Energy Shield to begin with", that means you will start a mission with one Shield point out of five, so you only have to buy the other four. #19: Helicopter in flight. Gives you "Laser to begin with", like Card #18, that means you'll start with one Laser point out five. #20: This pic shows a bomber dropping a bomb. Gives you "Mega Bomb to begin with", which gives you one Mega Bomb. #21: Player jet engaging at low altitude. Gives you a 5% additional speed to your plane. #22: Ministry of Propaganda card featuring General Mantis. Gives you "Night Camouflage". This Card unlocks an alternate color for your ship, turning it black. Once you unlock the Night Camouflage, there color change is permanent since there's no "Color change" option. There's four bonus objectives for each mission, at first you'll think you can skip those, but later in the game you're gonna need to achieve those objectives, and that means achieve all four of them, to unlock more missions and higher difficulties because they're the Medals. COLLECT 70% OF STARS: Picking the stars dropped by enemies you shot down and destroying at least 70% of the enemies in the level. Something that is not out of reach regardless of the difficulty. STAY UNTOUCHED: To obtain this medal, you have to complete the mission without getting hit. If you get hit and recover your full health doesn't count. 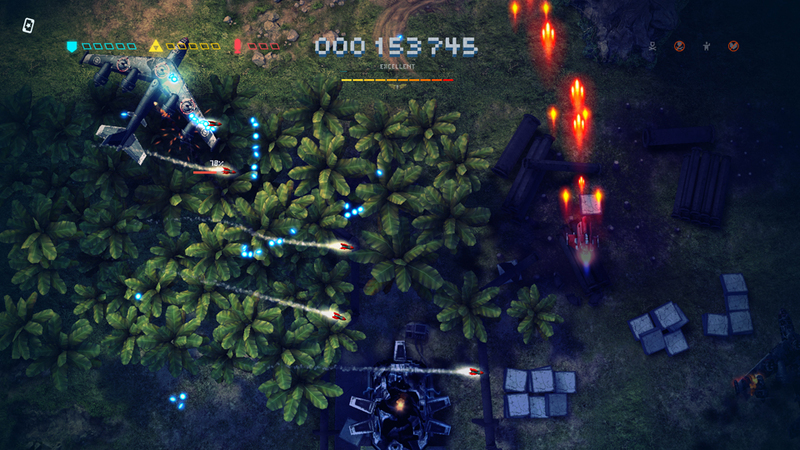 Destroying enemies is not just part of the mission objectives, it is also a scoring element since they create Chains. Above the "Weapon Upgrade" indicator there's another gauge. That's your Chain Gauge. Each time you destroy an enemy formation you'll be filling that gauge. Once its full, it will give you a bonus score. Keep in mind, the stage length determines how far you can get in the Chain-making. You can reach higher bonuses in certain levels like Godlike or Funky in stages 8 or 9, but not in stages 1 or 4, while the endless Tournament levels allows you to reach Fantastic and Amazing Chain bonus. Now that we have all the gameplay features analyzed, let's talk about the gameplay. This game is a basic vertical shooter, and when i say basic is because it is, so all Touhou Project, Dodonpachi and "Danmaku" enthusiasts better find something else because it might be boring for ya'. Like 1941 Counter Attack, the game throws simple enemy formations with easy attack patterns that doesn't require too much memorization. The only things you have to really worry about are the Laser cannons and Missiles fired by helicopters and large planes since they can deal heavy damages or instant death if you don't have your health upgraded. So upgrading the Health and Main Cannons are the top priority. The unlockable difficulties are mostly focused on increasing the enemy strength and damage tolerance rather than adding more bullets, but the difficulty also increases the number of Stars that you get during your mission as a bonus. Although the game is focused on full-scale offensive action, there's one stage that makes an exception. Stage 5. This level is focused on dodging enemy fire since you're plane is disabled by an EMP pulse, so the only thing you can do is to dodge the enemy fire and pull your luck to its limit by trying to save all the 17 comrades and picking all the stars which will make the 75% and 100% Star bonuses since you can't destroy the towers if you're disabled by the EMP. Although the towers are destructible it is quite of a mammoth task since the EMP has homing properties and as you climb the difficulty, the towers strength increases. The game lacks of extra lives, you only have one try to complete a stage. If you die, it's Game Over and you'll have to select the level and buy weapons all over again. 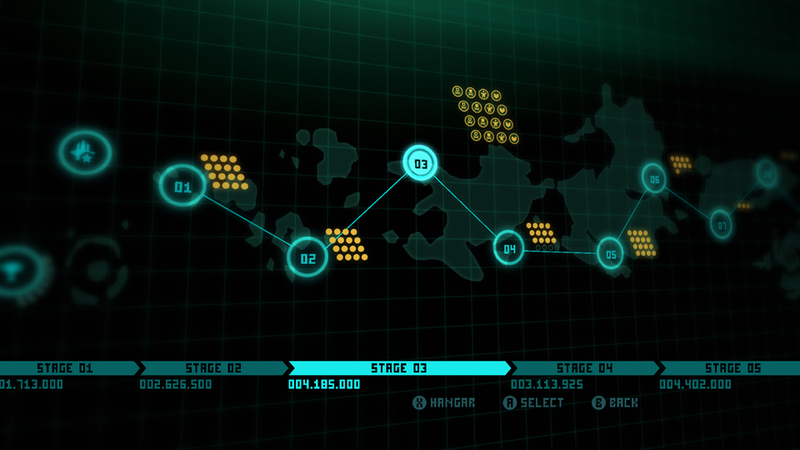 However, since the enemy formations are easy (even on the hardest difficulty levels), it isn't a difficult task at all. 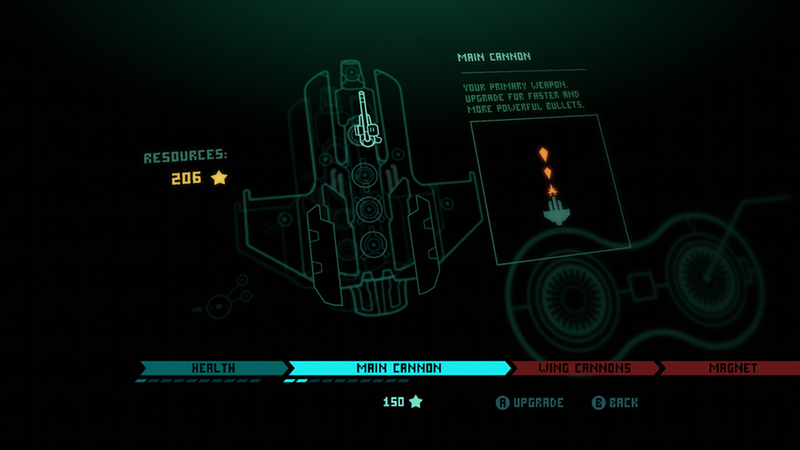 Also, you will keep the amount of stars that you've got before dying so you can use them to upgrade your ship again. Just like the Die-in-purpose trick from the SNES port of U.N. Squadron, but dying will affect your status as they drop your Overall Performance (dying 20 times will drop you to 89.00%). There's four difficulty levels to unlock in this game: Normal is your initial difficulty level. Hard and Insane are the unlockable "per stage" difficulties after getting 4 medals on the previous difficulty. The final difficulty, Nightmare is unlocked until Stage 8 is completed. Another inclusion on the Anniversary version is the VIP Stage 9 which is the largest level of the game and featuring a new enemy who takes the place of General Mantis. To complete the new features, the game includes a Tournament, which is an each weekend competition where you're sent to the action in a neverending stage where the objective is to rack up the highest score possible. The only way to end the level is by dying. All the amazing graphic detail of the PSP port got a superb enhancement on the Anniversary version. The use of 3D objects and the particle effects adds an envolving atmosphere to the gameplay, not to mention the weather effects and realistic looking oceans which adds more visual detail to the environment. To complete the real-feel of the game's graphics, the explosions bring additional effects like shaking trees and in the case of nuclear plants, the force of the explosion will make its dome go fly at you in spectacular fashion. A stunning graphic Tour-de-Force of visual display and enjoyment for next-gen console owners. The mechanical design is a blend between Sci-fi and World War II plane designs, which brings something new and different from the common space fighters, modern day aircraft and the "Mecha Shoujo" genre that we're used to nowadays, but still blending the popular anime-style design of some of the aircraft. 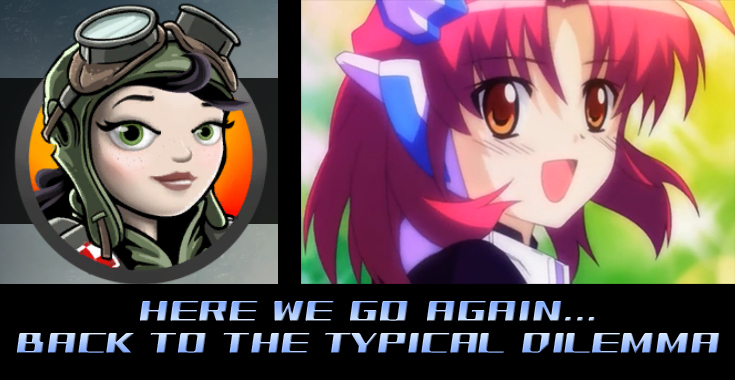 The game also brings the classic mid-90's cartoon look on the character designs such as Miss Krysia and General Mantis. While the character design evokes mid-90's Cartoon Network, USA Cartoon Express and Nickelodeon shows (Nicktoons for short), some fans could disagree with them, specially when the ship designs are have some anime-like designs. As for the music, there's not to much to say, just some slow paced ambient paces with some techno elements are the background music for the stages, i think there's a total of 3 tracks which they repeat in different stages of the game, and only one boss theme which has a faster pace and beat to fit the situation. To sum it up, Sky Force Anniversary is "The 1943-U.N. Squadron Mix-up" for XBox One, Wii U and modern PlayStations. Where simple vertical shooting action meets money investment elements. If a beautiful graphic display and some calm shooting action is what you want, then this game is for you.